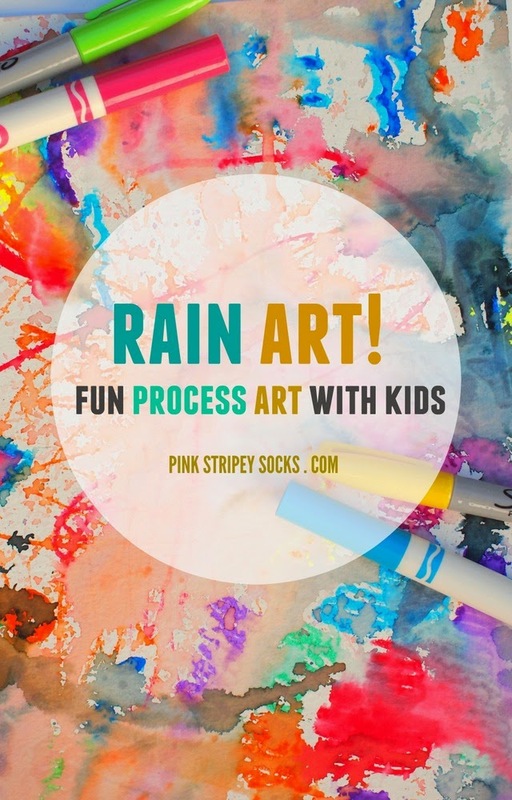 Let's Make Some Rainy Day Process Art! First we took our washable markers and doodled on a sheet of watercolor paper together. Then we placed our artwork on a plate outside. Then, we listened to the rain fall and watched the colors swirl and blend together. I pulled the picture in before everything blurred together. Then, Chuck and I talked about what we saw happening outside to the artwork. Chuck also enjoyed pouring off all the excess rainwater. Then the rain stopped. Hopefully we'll get some more rain soon. Cross your fingers for us, k? Next time we'll grab our crayons and watercolors and try doing some more rainy day artwork. Happy creating and exploring, friends! Looking for other easy ways to make art with young kids?